Prior to the Roman conquest, a large part of Western Europe had adopted the newly developed La Tène culture. As the Roman domain expanded, a cultural and linguistic division appeared between the mainly Greek-speaking eastern provinces, which had formed the highly urbanized Hellenistic civilization, and the western territories, which in contrast largely adopted the Latin language. This cultural and linguistic division was eventually reinforced by the later political east-west division of the Roman Empire. The Western Roman Empire and the Eastern Roman Empire controlled the two divergent regions between the 3rd and the 5th centuries. The schism is the break of communion and theology between what are now the Eastern (Orthodox) and Western (Roman Catholic from the 11th century, as well as from the 16th-century, also Protestant) churches. This division dominated Europe for centuries, in opposition to the rather short-lived Cold War division of four decades. 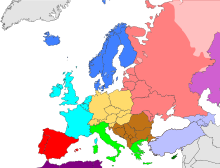 Since the Great Schism of 1054, Europe has been divided between Roman Catholic and Protestant churches in the West and the Eastern Orthodox Christian (many times incorrectly labeled "Greek Orthodox") churches in the east. 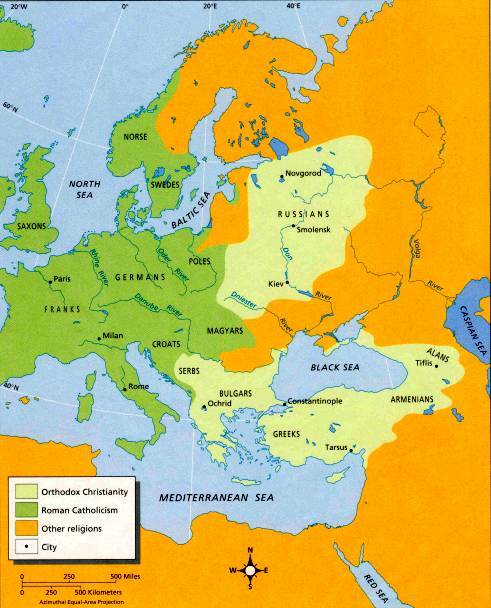 Due to this religious cleavage, Eastern Orthodox countries are often associated with Eastern Europe. A cleavage of this sort is, however, often problematic; for example, Greece is overwhelmingly Orthodox, but is very rarely included in "Eastern Europe", for a variety of reasons. In 1948 the Treaty of Brussels was signed between Belgium, France, Luxembourg, the Netherlands and the United Kingdom. It was further revisited in 1954 at the Paris Conference, when the Western European Union was established. It was declared defunct in 2011 after the Treaty of Lisbon, and the Treaty of Brussels was terminated. When the Western European Union was dissolved, it had 10 member countries, six associate member countries, five observer countries and seven associate partner countries. Geography: Realms, Regions, and Concepts has been published since 1971 and now in its 17th edition. It was written by the authors Jan Nijman, Peter O. Muller and Harm J. de Blij. It is used in many US schools to teach students world geography. Using the CIA classification strictly would give the following calculation of Western Europe's population. All figures based on the projections for 2018 by the Population Division of the United Nations Department of Economic and Social Affairs. Using the CIA classification a little more liberally and including "South-Western Europe", would give the following calculation of Western Europe's population. Other Indo-European languages include the Celtic group (that is, Irish, Scottish Gaelic, Manx, Welsh, Cornish and Breton). Basque is the only currently living Western European language isolate. Multilingualism and the protection of regional and minority languages are recognized political goals in Western Europe today. The Council of Europe Framework Convention for the Protection of National Minorities and the Council of Europe's European Charter for Regional or Minority Languages set up a legal framework for language rights in Europe. Switzerland and Luxembourg have the highest average wage in the world, in nominal and PPP, respectively. Denmark ranks highest in the world on the Social Progress Index. ^ Ricci, Matteo (1610) . On Friendship: One Hundred Maxims for a Chinese Prince. Translated by Timothy Billings. Columbia University Press. pp. 19, 71, 87. ISBN 978-0231149242. ^ "The geopolitical conditions (...) are now a thing of the past, and some specialists today think that Eastern Europe has outlived its usefulness as a phrase." "Regions, Regionalism, Eastern Europe by Steven Cassedy". New Dictionary of the History of Ideas, Charles Scribner's Sons. 2005. Retrieved 31 January 2010. ^ Berglund, Sten; Ekman, Joakim; Aarebrot, Frank H. (2004). The handbook of political change in Eastern Europe. Edward Elgar Publishing [via Google Books]. p. 2. ISBN 9781781954324. Retrieved 5 October 2011. The term 'Eastern Europe' is ambiguous and in many ways outdated. ^ a b "Confirmed: Czech Republic is in Western Europe, says US textbook". News.expats.cz. ^ "Field listing: Location". CIA World Factbook. Archived from the original on 24 May 2011. Retrieved 30 July 2017. ^ UNAIDS, The Governance Handbook, January 2010 (p. 29). ^ a b "World Population Prospects 2018". ^ a b c "Europe". Encyclopædia Britannica. 2007. Retrieved 10 June 2008.